Morgan Stanley: "The Earnings Recession Is Here"
A fresh round of snow, ice, and rain is hitting the mid-Atlantic this afternoon. By late evening, the storm is expected to sweep across the Northeast into Tuesday night. A quick burst of winter precipitation will be the primary threat across the interior (north of the dashed line) with rain closer to the coast. 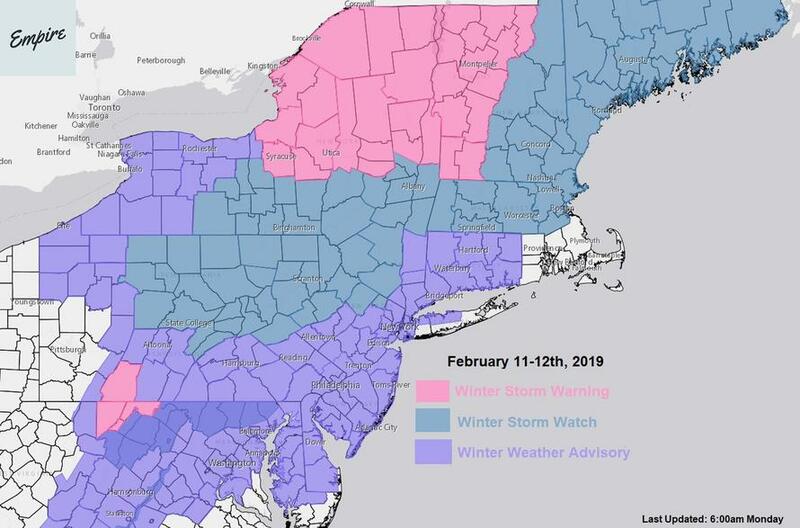 Starting Tuesday morning, commuters in New York and the Northeast could experience delays along Interstate 95 and at regional airports in the affected areas. A low-pressure system moving through the Midwest and the Great Lakes has unleashed a mix of winter precipitation across the mid-Atlantic Monday. By late evening, the storm’s crosshairs will be aimed at New York, Boston and the other municipalities along Interstate 95. “A fast-moving storm will impact the Northeast Monday night through Tuesday night with a plethora of precipitation types. Initially, enough cold air will be present to promote snow from Philadelphia to Boston Monday night into Tuesday. However, warmer air will turn snow to sleet and rain from south to north Monday night through Tuesday evening, making for a messy mixture of precipitation and a tricky morning and evening commute for many Tuesday. At this time, 1-3 inches of snow is expected from Philadelphia to Boston, along with a messy coating of sleet and ice on top before a change to rain. 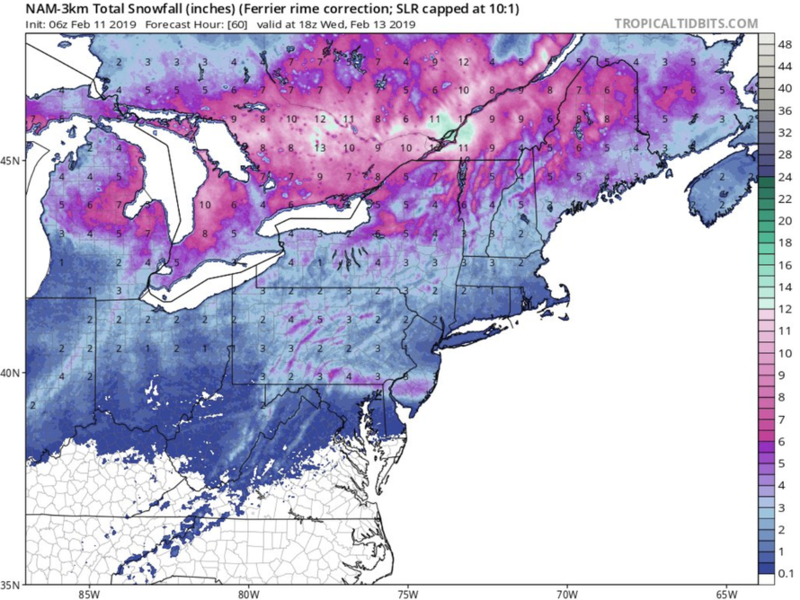 Across the interior, 3-6” of snow along with an icy mix is expected including Allentown, Pa. and Hartford, Ct. 6-12” of snow is likely across northern New York and northern New England, benefiting ski areas ahead of the President’s Day weekend. All precipitation will end Tuesday night into Wednesday morning from southwest to northeast,” stated Ed Vallee, owner and meteorologist at Empire Weather LLC. As of 6 am ET Monday, the latest winter watches, warnings, and advisories stretch from Virginia to Maine through midweek. In addition to the Northeast, eastern Iowa, Wisconsin and northern Michigan will experience the worst snow. Over the weekend, the Pacific Northwest got hammered, with more than a foot dumping on parts of the Seattle-Tacoma International Airport, NOAA NWS Weather Prediction Center said. After the mid-week storm dissipates, temperatures will jump to 50 degrees Fahrenheit in New York before the second winter storm starts to move east this weekend. This entry was posted on Monday, February 11th, 2019 at 1:35 pm and is filed under Immediately available to public. You can leave a response, or trackback from your own site.